There was a big announcement by Microsoft Teams. Microsoft Teams is now being offered in a Free version worldwide. This capability is intended to provide Microsoft Teams to small businesses and groups of users who do not have access to an Office 365 subscription. Collaborate with up to 300 people. Anyone can use this free version of Microsoft Teams. 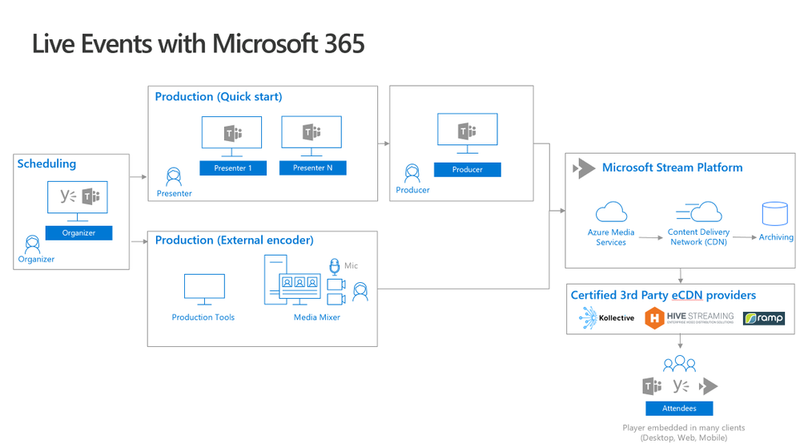 However, if you use an identity that is associated to an instance of Office 365, the user will be routed to the Microsoft Teams user experience managed by Office 365. Microsoft Teams had a recent important announcement. Live Events has gone into preview. Live Events is a capability that allows for one to many content and video sharing to large audiences. Events can be scheduled through Teams, and then Stream delivers the webcast. This solution is intended to replace Skype Meeting Broadcast over time. Producers will have the ability to monitor the event itself. 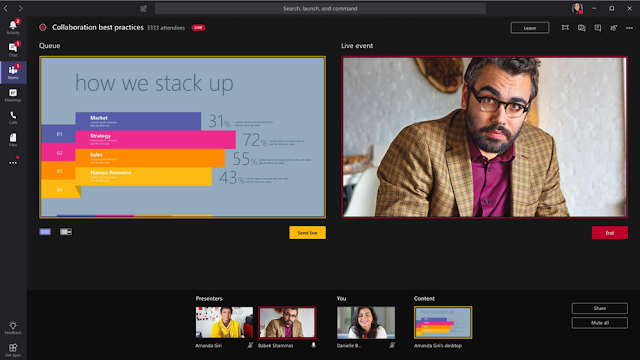 They will have the ability to start/stop, share video, share desktops, chat with event attendees, view live attendance data, moderate question / answer, manage captions, etc. Presenters will have the ability to share content and moderate question and answers. Attendees can attend the event from browsers, desktops and mobile devices. They have the ability to pause the stream and restart it on demand. They can interact through question and answer.